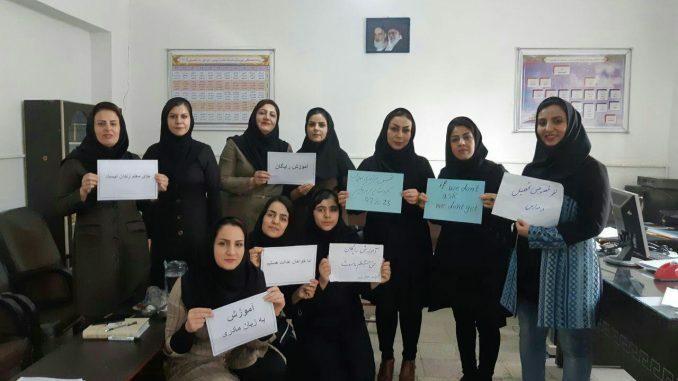 Iranian security and judicial authorities responded to the second round of peaceful teachers’ rights strikes by arresting and summoning alleged participants in several cities across the nation. The Teachers’ Trade Organizations’ Coordination Council (TTOCC) reported that following the strike on November 12-14, 2018, at least 13 protesters were arrested, more than 30 were summoned for questioning and 50 others were threatened by security agencies over the phone. According to the TTOCC, the following people were taken into custody: Ali Koroushati, Pirouz Nami, Mohammad Reza Ramezanzadeh, Saeed Haghparast, Ali Foroutan, Hamid Reza Rajaie, Hossein Ramezanpour, Hassan Jowhari, Mohammad Robati, Mohammad Ali Zahmatkesh, Mohammad Kord, Fatemeh Bahmani and a person only identified by the last name of Vaezi. 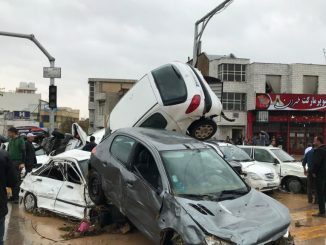 “Pirouz Nami, the secretary general of the Iranian Teachers’ Trade Association [ITTA] in Khuzestan Province and his deputy Ali Koroushati were arrested at 2:30 in the morning [November 13] at their home after holding talks with a member of Parliament from Ahvaz on Monday night [November 12],” a teachers’ rights advocate told the Center for Human Rights in Iran (CHRI) on November 18. The Islamic Revolutionary Guard Corps’ (IRGC) Intelligence Organization had demanded that Nami and Koroushati withdraw their call for the protests and had them arrested after they refused, according to the TTOCC. 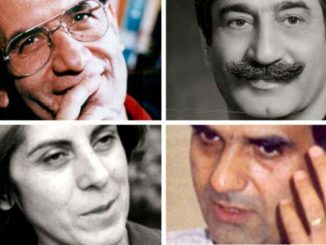 The TTOCC’s protest call, issued November 7, demanded higher wages, reforms to Iran’s educational system and the release of teachers who have been imprisoned for their peaceful trade union activities. “We believe that the teachers’ demands are practical and lawful and we declare that if the present trend continues, the protests will continue at all costs in the coming months,” added the statement. But labor activism in Iran is seen as a national security offense; independent labor unions are not allowed to function, strikers are often fired and risk arrest, and labor leaders are consistently prosecuted under catchall national security charges and sentenced to long prison terms. The rights’ activist who spoke to CHRI anonymously to protect their personal security noted that the striking teachers are also opposed to the government’s professional ranking plan for favoring some teachers over others based on an arbitrary performance grading system. Teachers were also arrested during the first round of strikes that took place last month from October 13-14. Mahmoud Beheshti-Langroudi: A former ITTA spokesman, Beheshti-Langroudi’s most recent imprisonment began in September 2017. He is serving multiple sentences for his peaceful trade union activities in Evin Prison. Rouhollah Mardani: In June 2018, Mardani, a graduate student in Persian literature at the University of Tehran who had also worked as a teacher in the city of Nourabad in Lorestan Province, was sentenced by a preliminary court to six years in prison. He was also banned for two years from political and social activities and prohibited from leaving the country for two years. Mardani was imprisoned for taking part in peaceful protests on campus in late January 2018; the charges he was convicted of are unclear. He is in Evin Prison. Mohammad Habibi: Arrested for peacefully advocating teachers’ rights, Habibi was sentenced by a preliminary court in August 2018 to seven years in prison and 74 lashes. He was also banned for two years from political and social activities and prohibited from leaving the country for two years. Habibi was convicted of the following charges: “assembly and collusion against national security,” “propaganda against the state” and “disturbing public order.” He is in the Great Tehran Penitentiary.